Last Sunday might have been Big V match day for VAFA women, but to Fitzroy-ACU players, it was known only as Rosso Day. 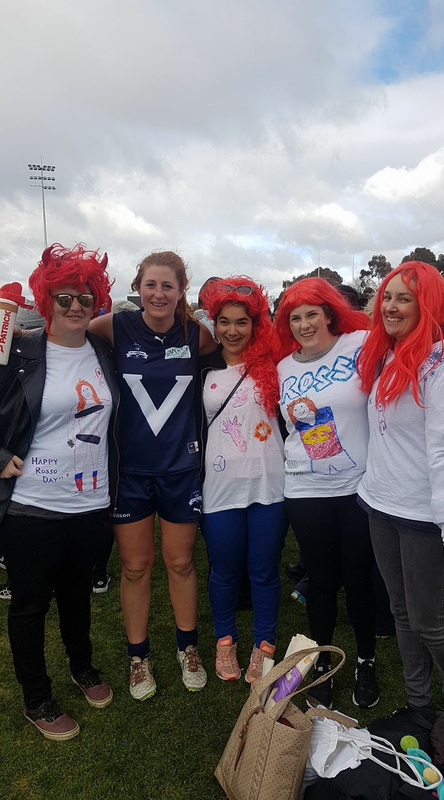 The players trekked to Ballarat to watch their teammate Tash Ross-Harris play in the inaugural Big V women’s team, and wore bright red wigs to celebrate red-head Rosso. Tash contributed to the Big V’s 49 point victory over AFL Goldfields at Mars Stadium, where Fitzroy-ACU player Frankie Freeman says Rosso’s biggest fans braved very cold conditions to support their teammate. “We were all super proud of Rosso and wanted to get around her Roygirl style, which means going all out and having a bit of a laugh,” Frankie says. 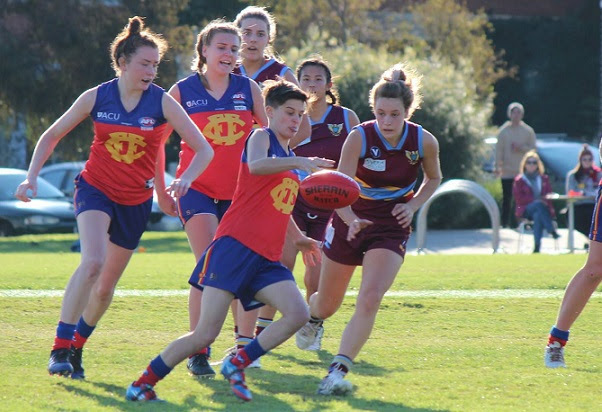 The Fitzroy-ACU women weren’t the only people lauding Tash on Rosso Day, with the VAFA website’s wrap of the game praising her strong performance in the ruck for the Big V.
Fitzroy players won’t be wearing their trademark red and royal blue socks this weekend, in an effort to raise awareness about mental health. 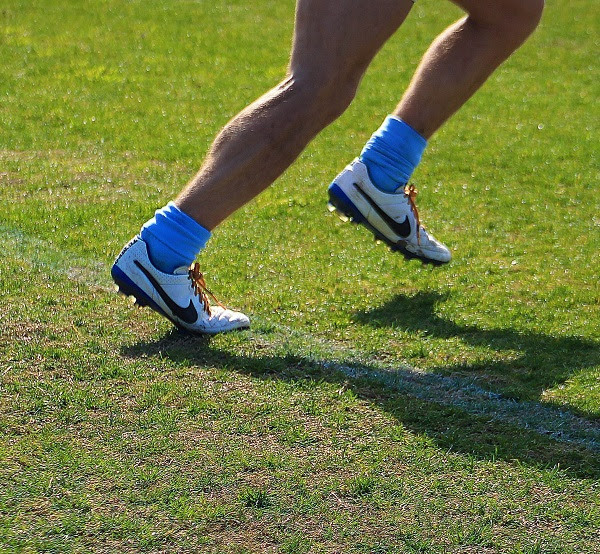 The club will again participate in Thick and Thin round, where VAFA home teams wear navy socks, and away teams wear sky blue socks. It’s the third year running that teams across the VAFA will take part in Thick and Thin, an initiative which encourages players to start the conversation around mental health. VAFA has partnered with the Mental Health Education Group, who will deliver Mental Health First Aid training to players and key stakeholders throughout the competition. All profits raised will go towards the costs associated with that training. The initiative recognises the fact that one in four young people in Australia will experience a mental health issue at some point. More information is available on the Thick and Thin website. It’s not just in the amended lyrics of the club song that the Brisbane Lions pay tribute to the ‘Fitzroy of old’. Every year they back up their commitment by sponsoring emerging Fitzroy stars. 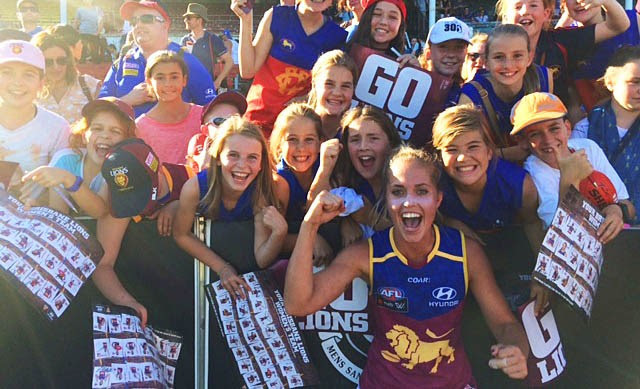 Given the overwhelmingly positive response to the inaugural AFLW side, and Fitzroy FC’s commitment to women’s football, Sam Lord says it seemed only natural to also nominate a women’s player in 2017. Emile Pavlich (known to his team mates and fans as Lewis or Louie) says he’s been bashing and crashing into the opposition at Edinburgh Gardens since he was 10 years old. 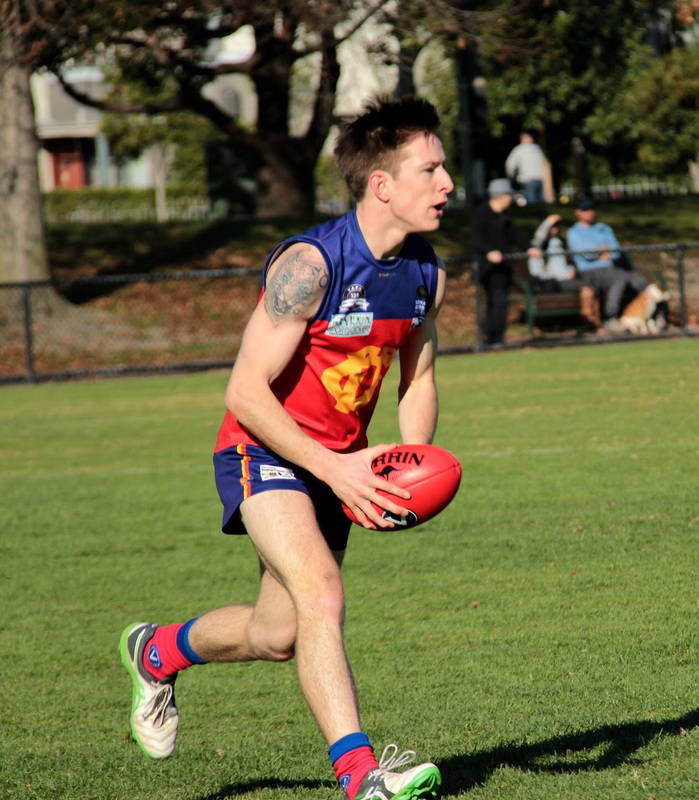 Now in his second year of senior football with Fitzroy, Emile started at Alfred Crescent and slowly transitioned on to the Brunswick Street Oval. “The Brisbane Lions was a team of superstars at the height of its illustrious back-to-back-to-back premiership streak that ended in 03,” says Emile. “The generation of kids at age 5, 6 and 7, like I was, felt inspired by such a dominant team. Emile thinks the Brisbane Lions’ sponsorship of younger senior players is a fantastic initiative, and feels very grateful that such a proud and professional club has sponsored him in 2017. As for Fitzroy, Emile says playing for the mighty Roys means a lot. 2017 has been a momentous year for women in football, and who better to discuss it with than Angela Pippos, one of Australia's leading sports journalists. Angela will be Fitzroy's special guest at our third annual Women in Football lunch on Saturday July 22nd. 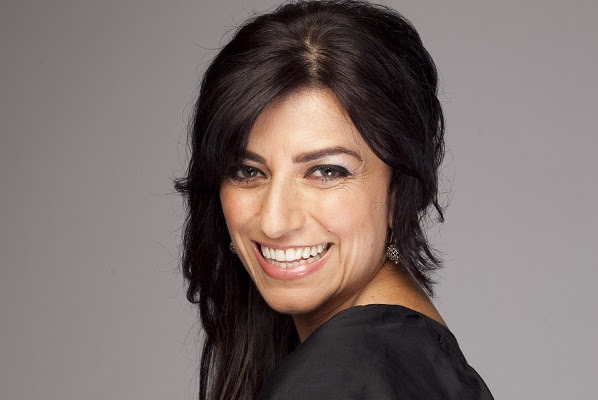 Angela is a journalist, TV presenter, radio personality, author and MC, and a dedicated Adelaide Crows fan. She’s appeared on many sports programs including Network Ten’s Before the Game and The Back Page on Fox Sports and is a regular on ABC radio and TV. She has just released her second book, Breaking The Mould – Taking A Hammer To Sexism In Sport and the television documentary she wrote, produced and presented about the rise of women in Australian Rules football, League of Her Own, aired on the Seven Network in February 2017. Book now for the lunch as tickets are selling fast, so don't miss out. Bookings will close on Wednesday 19 July or as soon as they sell out. Fitzroy players at all levels of the game are using Pilates for fitness and strength. This year, 10 players are undertaking a series of Pilates studio sessions as part of das Studio’s Pilates sponsorship of the club. Rory Angiolella, Mitch Bottomley and Julian Turner are three of the players who have been participating in Pilates sessions at the Smith Street studio this year. “Part of my ongoing physio plan was to start Pilates at das Studio and since I’ve started the program, I’ve felt continuing improvements in my body and am feeling more balanced and stronger through my hips, which is something I had been really struggling with this year,” says Rory. Mitch says he has used the sessions to take the time to feel and learn more about the strengths and weaknesses of his body. “I have felt the improvement of body and mind in games and at training,” he says. Helen Saniga from das says Pilates is a brilliant and accessible method of exercise that releases, mobilises, and strengthens the body. “Through its fundamental principles it encourages the mind and body to work together, opening neural pathways, promoting flexibility, balance, and coordination that are essential as we age. Through its focus on core and muscle length, it also does a great job of toning and buffing,” she says. Helen says the studio has this year been joined by Elizabeth Hewett, a qualified physiologist as well as highly regarded and experienced Pilates practitioner, who is overseeing the programs and progress of the Fitzroy players. “Her experience and training are invaluable in transitioning elite athletes from injury to realising their full potential,” she says. Helen says das is abuzz with a range of classes including teenage programs, private and small group studio sessions, and the recently introduced Ageing Gracefully sessions for over 50’s. Das are offering members of the FFC community a 20% discount on either of the startup packages that they offer. This offer will be available until 31 December 2017. If you’d like to start Pilates at das, contact Helen on 0412 503 771. 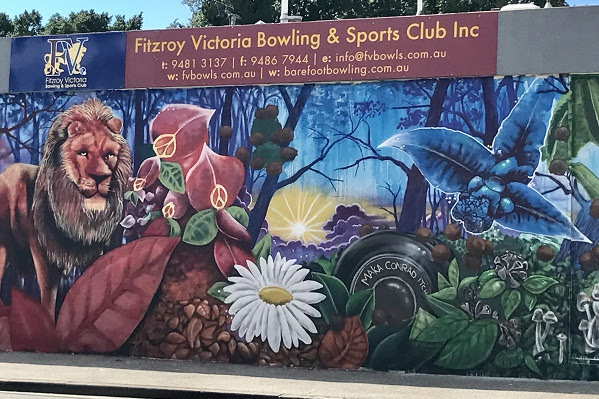 Register now for Fitzroy Victoria Bowling & Sports Club’s new knockout bowls competition and discounted social membership just for Fitzroy players, sponsors, and supporters. Book your team of three in for a fun morning of social bowls, a lesson, plus a free BBQ. The competition will take place on Sunday 30 July from 11am to 1.30pm at the Fitzroy Victoria Bowling & Sports Club on Brunswick Street. Book your place by 26 July by emailing your team name, and names of the three team members, to bowlinglions@tpg.com.au. Mixed teams are fine. Fitzroy supporters travelling to Essendon to watch the Reserves and Seniors this weekend are invited to attend St Bernard’s pre-game function. Entry to the upstairs bar will be $5, with finger food available. The bar will be open from 12.30pm, and all are welcome. There is no need to book, as entry is payable at the door.